The original version of this article was published in the online music magazine FDRMX in 2015. I got to Bob Dylan late. I was well into my late thirties/early forties when I started to dive into the legendary songwriter’s music, mainly because I hadn’t been exposed to many of his songs before, but more than likely because the few times I had heard the man – “Knockin’ on Heaven’s Door,” “All Along the Watchtower” – his voice had turned me off. This is a common complaint about Dylan, and now that I am aware of his genius I completely admit I was wrong: His voice is as important a part of what makes him great as his passionate gift for words. I also got to Dylan’s concert late on April 21st at the Broward Center for the Performing Arts in Fort Lauderdale, FL. It was the first time I would see him live, and as I got stuck in a traffic jam en route I was already feeling a little worried. Lo and behold, as I entered the theater Dylan and his band were well into the first song of the night, “Things Have Changed.” It took me and my friend Gerry some time before we could find our seats in the dark, and although by then the group had moved on to “She Belongs to Me,” it was clear from the pristine sound echoing around the hall that this would be a special night. By the third song, the rapturous “Beyond Here Lies Nothin’,” I had already begun to tune out the two rude ladies who kept talking and laughing loudly behind us – but still I was thankful when Gerry turned around and told them to shut up. And they weren’t the only ones yakking away or sending texts throughout the performance. It never ceases to amaze me when people come to a concert of any sort just to “hang out.” Isn’t it supposed to be about the music? I’m sure as a performer it must be irritating to play to an impertinent audience who couldn’t care less. But it’s a testament to the band’s power that even with these distractions, I was able to concentrate fully on the show. And what a show it was. Dylan commandeered the stage just like the elder statesman he is. He may be 73 and a bit slower, but whether singing his heart out, playing a grand piano, or effortlessly letting his harmonica speak volumes about loneliness and love, he’s a lesson in craftsmanship. This was a performance that captured a simplicity that’s hard for me to describe, but that was palpable all around me: In the no-frills stage, with Fresnel lamps beautifully highlighting each player; in the almost delicate, yet powerful interactions between the band; in the way the songs somehow shine a light on decades of living. I don’t want to sound mawkish, but hearing Dylan perform a track such as “Simple Twist of Fate” forty years after he first recorded it becomes much more powerful when considering the young man’s words are now being sung by a much older man, separated by the hazy fog of experience. Throughout the night Dylan alternated between bouncy numbers such as the jazzy highlight “Spirit in the Water,” blues-infused themes like “Early Roman Nights,” and heartbreakers in the vein of “Forgetful Heart.” Dylan has always been notoriously unpredictable when it comes to setlists, so I wasn’t surprised to see him stick closely to his awesome 2012 album Tempest and in general avoid the more well-known classics. There was no “Like a Rolling Stone” or “Desolation Row,” from Highway 61 Revisited. There was no “It’s Alright, Ma (I’m Only Bleeding),” from Bringing It All Back Home. No “Knockin’ on Heaven’s Door,” “All Along the Watchtower,” “The Times They Are a-Changin’,” or “Just Like a Woman.” And that’s okay – the freewheelin’ troubadour has so many iconic songs, it would be easy to expect a “greatest hits” tour. But it would also be contrary to what Dylan is, and I was actually glad this wasn’t the case. There’s also a lot to be said for Dylan’s backing band, many of whom have played with him before in many albums and tours. Whether it was the double attack of guitarists Charlie Sexton and Stu Kimball, the upright bass swing of Tony Garnier, the subtle shadings of Donnie Herron on lap steel, banjo, and violin, and the assertive rhythms of drummer George Receli, it is obvious these guys are tight as can be. If there’s a perfect use for the term in the pocket, it definitely applies to Dylan’s band: Each player is exactly where he needs to be in the groove, not overpowering the others or falling unnoticed, but rather complementing each other. And this is also true of Dylan himself, his singing and playing just another essential cog in this flawless machine. 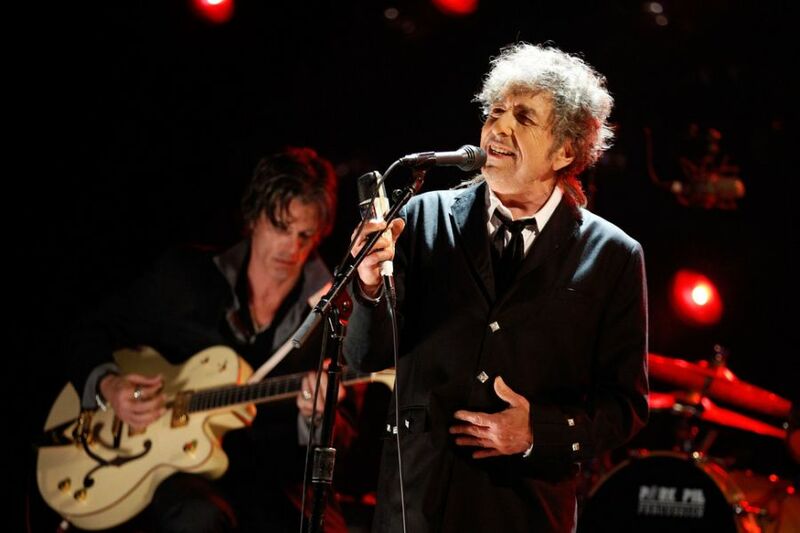 By the end of the night, Dylan treated the audience to a piano-infused version of “Blowin’ in the Wind,” and closed with the cover “Stay with Me,” the only song he played from his current album Shadows in the Night. After the last note was played, the band retreated quietly and without adornment, as modest and sincere as their performance had been. Classy. I may have not gotten to see Dylan the young opinionated poet rabble-rouser. I may have not gotten to see Dylan the folk hero gone electric at the Newport Folk Festival. But I got to see Dylan the wiser old icon, reflecting on stage about his own long and storied legend. And that’s alright with me. Better late than never.